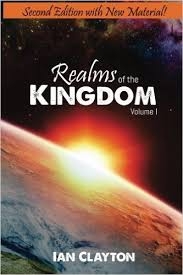 Realms of the kingdom Vol 1 | Karmal Books online Christian books and media store. Realms of the Kingdom will equip believers with the reality of what it means to be 'in the spirit' and in the realms of God, enabling them to know and experience who the person of God really is. This book will be a valuable resource enabling you to actively participate with and know your Father God, not just doing things for Him. This book is for those who want to see the reality of the supernatural realms of Heaven and the return of the sons of the Kingdom to their rightful place as heirs. Volume 1 will lead you on a journey through Ian's experiences in heavenly realms and includes steps and prayer activations enabling you to understand, experience and enter these realms yourself.